An airline has announced a new service from Manston to Amsterdam with the creation of 28 jobs in Kent. KLM Royal Dutch Airline which is merged with Air France said it will run a twice daily service from the Kent airport to Schiphol in Amsterdam. In September KLM asked Manston to conduct a survey to find out what the level of demand was for the service. The new 55-minute flights will link Manston to more than 130 destinations from Amsterdam. The airport said that of the 9,300 responses to its survey, 80% came from CT postcodes in East Kent. Just over 80% said they would use a direct service to Amsterdam, with 60% then connecting with flights to other parts of Europe. Of those responding 96% said they would use Manston in preference to other airports. KLM is to run two morning flights from Manston, with one returning in mid-morning and the other in the evening. The New Zealand company Infratil, which also owns Prestwick Airport, put its two UK airports up for sale in March this year. Infratil said that it would “continue to seek a buyer for the airports and work with local stakeholders to review alternatives”. Together Prestwick and Manston airports recorded losses for the six months to the end of September of just over £2m. Passengers travelling through the airports fell by more than 180,000 during the period compared with the same time in 2011, although freight business increased. Budget airline Flybe pulled out of Manston in March saying flights from Kent were not economically viable. Manston has been valued at £7.6m. With the first departure to Schiphol at 06:30, local businesses should be delighted that KLM will begin scheduled flights from Manston to Amsterdam next spring. Experts have long argued that tourist flights to sunny destinations were not enough to sustain a commercially viable service from the East Kent airport. What KLM is offering is an opportunity to do business in Europe and return the same day. Perhaps more importantly Schiphol airport offers connections to the emerging economies of China and Brazil as well as North America. The option not to drive to Gatwick or Heathrow will appeal to many. The only concern is whether the catchment area for Manston is big enough to sustain the new service on offer. Thanet MPs have welcomed news Manston airport is to be linked with one of the busiest in Europe as it is confirmed flights to Amsterdam will start in April. International airline KLM announced yesterday it will run twice-daily flights to Schiphol – using aircraft that can carry up to 80 passengers. The move comes after a poll of Kent residents saw 9,000 responses, with “staggering support” for the international flights. The first of the 55-minute flights will take off at 6.30am each day, with the latest returning at 8.45pm. Thanet North MP Sir Roger Gale, pictured left, said: “For more than 20 years a few of us have staked our faith in the belief that Manston has a job-creating future as a successful regional airport. “We have, of course, seen some false starts but this is the first time that a major international flag-carrier has made a commitment to regular flights to mainland Europe. Thanet South MP Laura Sandys said the move makes the county more attractive for investors. The new service, starting on April 2, could create dozens of jobs and re-establish Manston’s reputation as an ideal airport for scheduled operators. It might also widen the appeal for potential buyers after New Zealand-based Infratil put the airport up for sale. The listed infrastructure investor’s Glasgow Prestwick and Kent airports are for sale after years of underperformance. 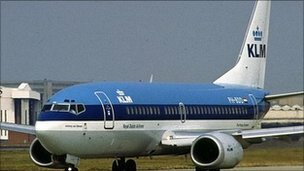 Last week, Dutch national carrier KLM confirmed it would start making twice daily flights from the Kent airport to Amsterdam from April 2013. Infratil executive Tim Brown says the process of selling the airports has taken longer than the company expected. He says the company now has to look at a range of complex proposals and if the use of an airport is going to change, it will have ramifications for local communities. Mr Brown says if airports are very successful then councils or cities often then tax them, but if they are struggling they may then either need subsidies or be closed and put to alternative use. He says the debate then becomes more complicated, which makes timeframes more difficult to guess. Mr Brown would neither confirm or deny whether Infratil is looking to buy Stanstead Airport in London. Posted: Friday, November 16th, 2012. Filed in News about Airports, Recent News.